Intramural sports play an important role in student life at Davidson and at many other college campuses across the nation. College students compete in football, basketball, soccer, softball, and many other sports as part of either a club or intramural team. These sports provide students with an escape from their schoolwork and grant them the ability to enjoy the thrills of competition. 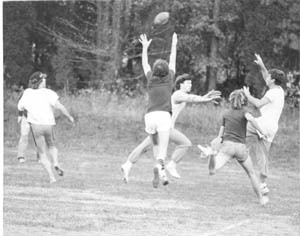 Other colleges across the nation moved to tag football at the same time, but the tag football played at Davidson developed a different set of rules, making it a sport unique to Davidson. This factor makes flickerball an important part of Davidson history since it is the only school that competes in this sport. It is played through both a traditional freshman flickerball league and an open flickerball league. Competition in these leagues is fierce; teams create chants and t-shirts for the games. Also game strategy is discussed in depth as each team attempts to find a play that will stifle the opposing defense. The term “flickerball” first came into use in 1954, but was not fully established until the following year. By this time, Davidson students had become accustomed to the new rules of flickerball, but it remained a sport played only by fraternity teams. All of the fraternities competed for “the sports trophy . . . given each year to the fraternity which acquires the most points throughout the year in interfraternity competition” (Feeney). During each year, points were given to the winners of each of the eleven inter-fraternity sports and for varsity sport participation. Coach Pete Whittle, the coordinator of Davidson intramural sports in 1953, encouraged students to compete in intramural sports because of the physical exercise and skills that can be acquired. Believing that students would be “better prepared for recreational participation after your college days are over,” he told students to “budget your time and play intramurals as often as you like” (Intramurals). 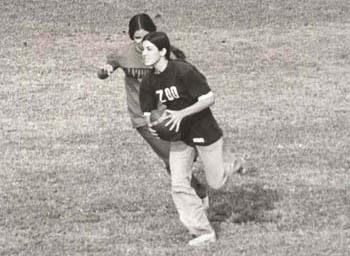 In 1974, the first female flickerball game was played. The game was played at IMAC, the Intramural Athletic Complex along with several other games that week occurring between such team as the Gozinyas and Rincon Rangers. By this time, flickerball had expanded to include teams outside of the previously fraternity based teams. Flickerball is a significant part of the Davidson experience and it obtains the best turnout from freshman halls as they form teams. With each incoming class, flickerball is taken seriously as each hall seeks to become the freshman flickerball champions. It is in this first year for students at Davidson that flickerball holds a special meaning because of the bonds and friendships that are created during the fall season. in Abundance As Teams Flick,” Davidsonian 4 October 1974: 11. New Tag Game.” Davidsonian 12 October 1951: 3. Monday.” Davidsonian 2 October 1953: 3.